This belt is 38mm (1½″) wide and made from bonded suede leather. 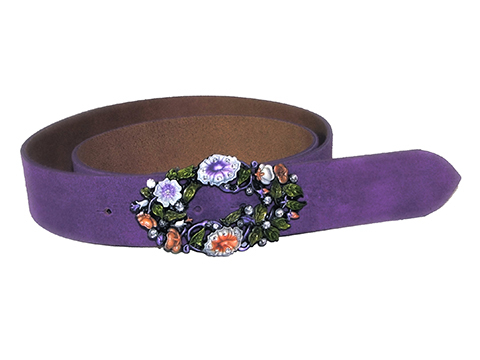 The buckle features the Morning Glory Flower complemented by diamantés. It echoes the Alphonse Mucha designs of the early 1900's. The buckle is made from tough zinc-alloy casting metal and has a durable black nickel plating with coloured enamel and diamanté inlays which compliments the suede leather strap. A belt loop is optional for this belt.